A Decade After Moneyball, Have The A's Found A New Market Inefficiency? The Oakland Athletics finished 2013 with baseball's fourth-lowest payroll, fourth-best offense, and best clubhouse chemistry. Debate has centered on whether the latter two are related. There's nothing objectionable about "good guy" genes—it's a solid organizational goal to have. But chemistry alone doesn't put runs on the board, and if a team is missing the talent, they better find the runs elsewhere. 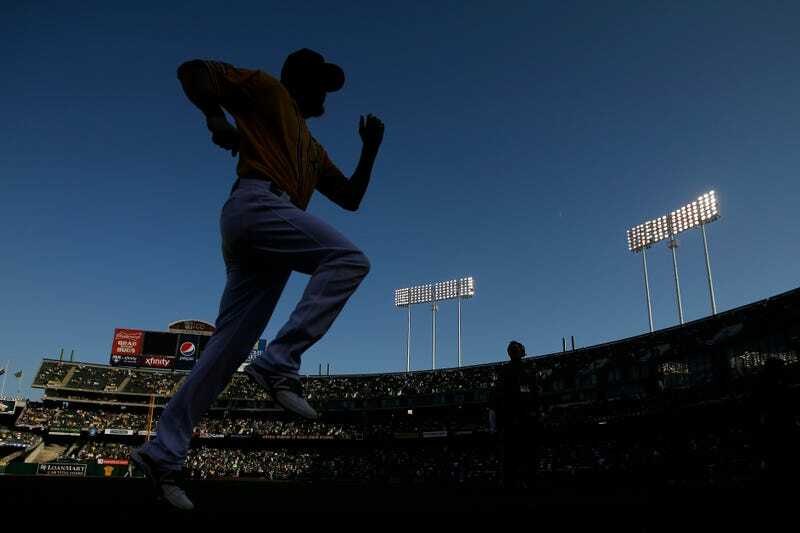 The 2002 Athletics discovered them in walk deities and college arms; once those methods pervaded front offices, the A's slipped back into losing. Was chemistry the only undervalued commodity of their recent resurgence? As the baseball community obtains more knowledge, roster construction strategies evolve. Previously undervalued talents like walks and defense are now accepted constructs. The A's are Hollywood-infamous for adopting them before their competitors while prices were low. After a 74-win 2011, they cheaply signed Brandon Inge and Jonny Gomes, who Brandon McCarthy claimed bolstered the clubhouse DNA to the tune of 20 wins. But Inge and Gomes were two of several players who also bolstered a less-visible statistic: fly ball-to-ground ball ratio. Let's contextualize Oakland's outlier ways: 60 percent of their plate appearances were taken by fly-ball hitters, who by definition compose 16 percent of the league. No other team in the past nine years has touched 45 percent. Beane's roster was so ground-allergic that only 0.8 percent of their plate appearances were taken by "ground-ball hitters." That's not just a concentrated effort to target fly balls. That's a mission statement. The Book: Playing the Percentages in Baseball devotes a chapter to platoon effects. Five pages discuss handedness, a mainstay of baseball analysis today. Two pages cover a less visible effect: batted-ball tendencies. Authors Tango, Litchman, and Dolphin found that fly-ball hitters had an advantage over ground-ball hitters, simply because they are better hitters—you can't homer on grounders, after all. They also found that fly-ball hitters are especially good against ground-ball pitchers, because the former tend to swing under the ball while the latter want the hitter to swing over the ball. However, Tango et al. noted that this platoon advantage is hard to exploit because players tend to be neutral rather than lean to either extreme. Also, the advantage itself is very small, and hence overshadowed by the handedness platoon. Such a minimal advantage would (theoretically) require being multiplied through several hitters to become meaningful. So what happens when a determined, resourceful general manager decides to overhaul his lineup with fly-ball hitters, capitalizing on a league-wide trend toward ground-ball pitchers? The 60 percent found earlier, segmented into pitchers faced. From above, fly-ball hitters have a .275 TAv—15 points above league average, and the mark of a top-five offense. If a team their distributed plate appearances this way, they would position themselves for offensive prosperity. How much did it help Oakland? Moreover, Oakland fly ball hitters hit .302 against GB pitchers, a matchup occurring nine percent of the time. Another way of putting that: In 547 plate appearances against ground-ballers, fly ball-hitting Athletics (such as low-salary acquisitions like Jed Lowrie and Brandon Moss) hit like $16-million Matt Holliday. The rest of the time—over 90 percent of PAs—they hit like Chase Headley.The 38 percent of their fly ball hitters' plate appearances against neutral pitchers resulted in a .282 True Average. That's better than the solid league TAv in that matchup (.276)—and it occurred for the Athletics four times as often! The Book claimed that managers weren't using this platoon advantage enough. It appears that Billy Beane has, effectively transforming his batting roster into 12 Chase Headleys and a Matt Holliday. But doesn't O.co Coliseum stifle fly balls? Yes, it still does. In fact, the Athletics hit .299 on fly balls—the 10th-worst TAv—and that's park-adjusted. Their slash line on fly balls was a pitiful .197/.191/.615. The Boston Red Sox, who had the next-highest percentage of plate appearances taken by air hitters at 39 percent, had a .409 TAv on fly balls (.313/.302/.855)3. Compounding the problem further is the A's hitting 1,198 fly balls, tops in the league. It's even worse if popups are included—no team came close to their 420 popups. Because Athletic batters had the platoon advantage so often, they hit many line drives, and "quality line drives" at that (only Tampa Bay, also a fly ball-inclined team, bested Oakland's line drive TAv). No matter how expansive O.co's dimensions are, it won't suppress the offensive gold that is a line drive.The purpose of acquiring fly ball hitters isn't necessarily to hit fly balls—it's also to hit line drives. Fly balls lie at the mercy of HR:FB rates and park effects. Those constants hardly affect line drives, though, and line drives are the best kind of batted ball, because they become hits two-thirds of the time. And when are hitters more likely to hit a line drive? When they have a matchup advantage! Hasn't this advantage been around forever? Perhaps, as The Book posited, the advantage was too small to be considered. A team could've developed a plan to target inexpensive fly ball hitters, but along the way realized that established edges like favorable handedness matchups, walks, or defense had a larger impact. Worse, the team might've disregarded those run sources, losing any advantage gained by the batted ball platoon.If other teams have attempted this approach, they weren't nearly as dedicated to it. So how has it remained an "inefficiency?" The A's deftly avoided this trap: not only have they benefited from the batted-ball platoon effect, but they had the second-highest percentage of favorable-handedness matchups. Thanks to a collection of switch-hitters, 70.4 percent of their plate appearances came against opposite-handed pitchers. They also had the third-highest walk rate, which isn't surprising—fly-ball tendencies go hand-in-hand with patience. Where the A's really kept on course was defense: Reddick and Young are not only fly ball hitters, they're established outfield pros. Cespedes improved considerably as a sophomore. With their starters funneling balls to the outfield5, the A's posted the league's second-best defensive efficiency. So despite an apparent re-calibration of team strategy, Beane remained loyal to proven sabermetric principles. A related theory on why no other team has capitalized on the A's air-ball plan: the advantage wasn't a net positive until now, after the growth of ground-ball pitchers. This is less verifiable because labeling a pitcher isn't an easy exercise. My one-deviation-above-the-mean method is always scaled to the league—it doesn't declare pitchers as a type based on an actual rate threshold. Given the rising ground ball to fly ball ratio, though, it's not unreasonable to suggest that this platoon advantage has increased enough to be potent. Ultimately, I'd postulate that in some cases, implementing a team-wide fly-ball initiative might've compromised in-place strategies. Because the advantage is small, it would've taken a roster revamp to legitimately capitalize on it. The A's did exactly that—they currently look nothing like their 2011 roster—but it couldn't have been simple. Budget, owner expectations, landing very specific players, competition, and environment are major influences on the process and result. If you're into endings, this generation of the Moneyball A's, like the 2002 team, lost the ALDS in five games. The irony lies in how: in 24 total innings against Justin Verlander and Max Scherzer, the Athletics scored three runs. Fly-ball pitchers limited Oakland's fly-ball batters to a .256 TAv during the season, and as you know, Verlander and Scherzer are extreme fly-ballers. Good process, bad playoff opponent. The outgoing players in Beane's 2012 trades have accumulated just 2.5 WARP, while 2013 discards included A.J. Cole and some everyday players. In 2012, Beane splurged on Yoenis Cespedes, whose own ground-ball rate fell significantly this year. "Ground-ball" and "fly-ball" hitter labeling will have a tiny number of misattributions due to small samples. For example, Lou Marson has demonstrated himself to be a trustworthy ground ball hitter in his career, but had only five plate appearances in 2013 and a two-to-one fly ball-to-ground ball ratio, which would make him mislabeled as a fly-ball hitter. This matters little because these plate appearances hardly move the needle, and batted-ball tendencies stabilize very quickly. Is it a coincidence that Boston scooped up Stephen Drew and Jonny Gomes after they left Oakland? Fewer ground balls also means fewer double plays: Oakland had the second-lowest number of them. In a clever twist, Athletics starters—Bartolo Colon, Jarrod Parker, A.J. Griffin, Tommy Milone, and Dan Straily—all had above-average fly-ball rates, and the A's as a team led the league in fly-ball rate allowed. As discussed, this would lead to home runs allowed in many cases (see Griffin), but the A's play 81 games in O.co and their outfielders have flashy leather. A's pitchers had the sixth-lowest slugging percentage allowed last season. Andrew Koo is an author of Baseball Prospectus.